11th September 2015, Friday – Online shopping via eCommerce platform is the ever-trending business these days. Online stores that are developed using e-commerce platform, not only help to reach out to large audiences, but also help in brand building. These stores are completely user-friendly, where people can shop without any hassle. Store management and quick shopping process are the benefits of online stores. For making an online store much more attractive and functional, the eCommerce site must be designed and presented using latest technologies. To increase their sales, everyone in the business, opt for e-commerce websites. Important technical strategies must be applied on eCommerce platform for the rapid increase in their business growth. Internet technologies allow marketing methods, advertising facilities, and search engine optimization methods for a business portal. People also mostly check for the required products through search engines, so it is important to optimize the business website to get a higher ranking in search engine result page. Product information, price, qualities, and online photos divulge the details to the viewer and make it easy to choose and shop for anything. 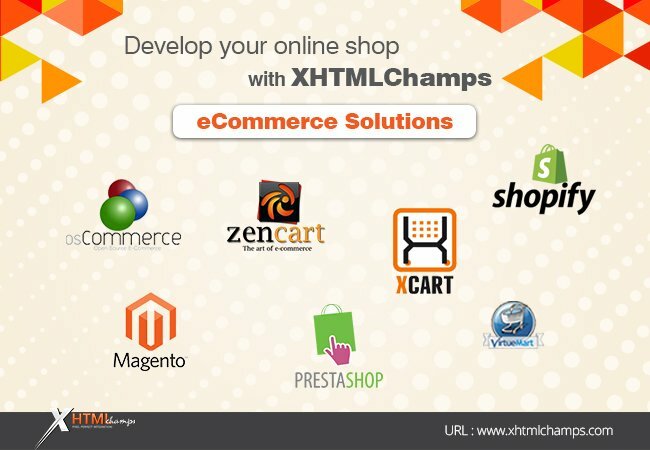 Taking an e-commerce integration service from Xhtmlchamps for creating a new eCommerce site, or upgrading an existing site is beneficial, as our e-commerce integration experts provide the best services as per the requirement of the clients and within the scheduled time. We integrate the e-commerce website using the latest technologies, to make it mobile, user and search engine friendly that helps the site to get ranking on search engines. Xhtmlchamps now starts 25% special discount offer for new orders, from 12th September to 30th September 2015. Avail this opportunity to make your website online well before and get more businesses in coming holiday season.